We’d love your help. Let us know what’s wrong with this preview of Confessions in the Dark by C. Yvette Spencer. To ask other readers questions about Confessions in the Dark, please sign up. 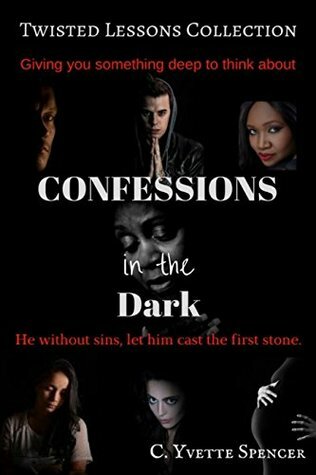 Gripping, breathtaking, and packed with fast flowing dialogue peppered with hilarious outbursts, "Confessions in the Dark" is like a modern "Saw" with more believable characters. The epitome of a page turner, this book simultaneously made my heart race in shocking anticipation while laughing at the conversations among the true-to-life characters. At first, I was worried that there were too many characters for me to keep track of. Then I realized I had succumbed to society's labelling, making my s Gripping, breathtaking, and packed with fast flowing dialogue peppered with hilarious outbursts, "Confessions in the Dark" is like a modern "Saw" with more believable characters. At first, I was worried that there were too many characters for me to keep track of. Then I realized I had succumbed to society's labelling, making my segregation easier. This judgement of people is one of the main themes that the author brilliantly laid out. To sum it up "Breakfast Club" style: The Teacher, The Businessman, The Student, The Musician, The Young Mother, The Pastor, The Transgender, all stuck together against their will, must reveal their deepest secrets in order to gain a chance of freedom. I was cringing at the continual reference to "the transgender" and the misuse of pronouns, until I understood that each character was assigned a label. Like "The Breakfast Club," the author deftly wove a tale exhibiting society's notions of who a person is based on a culture of judgement and ignorant labelling. This is book #2 in the "Twisted Lessons" series, and I am going to order another volume right NOW! A group of strangers in a room become dangerous adversaries or brave protectors, when they are held hostage and told by their captor that “Someone won’t be leaving alive.” Honesty, true character, morality and how we look at each other as humans comes into play. This story felt very experimental and edgy. It used emotions as identifiers and reactions as a group challenge in a dramatic, fearful situation that hopefully none of us will ever experience. The setting was a room with bare sensory detai A group of strangers in a room become dangerous adversaries or brave protectors, when they are held hostage and told by their captor that “Someone won’t be leaving alive.” Honesty, true character, morality and how we look at each other as humans comes into play. The setting was a room with bare sensory details, except for the people in it that effectively used stereotypes and pre-disposed belief systems for the characters to judge each other when survival and impending death for one of them becomes the primary matter at hand. The way names or stereotypes were used was initially shocking and quite offensive to me. Namely the character that was only called “the transgender." It was upsetting when this person wasn’t given a proper name, but only how they gender identified. After thinking about this story for a while, I concluded that this story was not about being racist or finger pointing at all, it was brilliant. How had I missed the point? Maybe I am touchy and too quick to react, which I believe was the author's design. The author effectively placed ignorance in a rectangle and demonstrated how we might unfairly judge each other in a vacuum without knowing people, giving their good deeds, feelings or empathy any credence for who and what they are. I won't give the ending away, but hellfire and brimstone is evident, as is also the enduring beauty of the human spirit to rise up and become something better. There is no doubt in my mind that the author would agree with what my grandfather used to say, ‘There is no such thing as an atheist in a foxhole." If you are a deep thinker, like to challenge ignorance and unfair stereotypes, this one will stick with you.